Treating ceilings can result in the best solution for acoustic sound control. This is particularly true in commercial installations where windows, doors and art can make hanging acoustic panels on walls impossible. Drop ceilings can also provide a conduit for sound transmission if left unchecked. 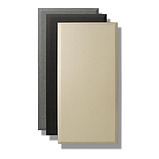 Primacoustic offers a wide array of ceiling panels for all kinds of situations. 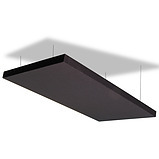 The modular Stratus ceiling cloud is designed for studios that want optimum control at the mix position. The Nimbus follows a similar path with more affordable hardware making it ideal to control sound in restaurants, cafeterias and commercial spaces. The Cumulus tri-corner trap fits up and out of the way for rooms that have limited ceiling and wall space while the Radiator can be used to create a transparent cloud for added architectural flare. T-Bar ceilings can be retrofitted with StratoTiles for improved acoustics while the ThunderTiles can be used to both control acoustics and stop sound from traveling between rooms. Primacoustic offers a wide selection of acoustic panels to suit all types of acoustic requirements. This includes our premium Broadway panels that feature fabric covered high density glass wool for the most demanding applications such as recording studios, broadcast facilities, post production houses or audiophile listening rooms. And because each Broadway panel is tested to be fire safe, they are ideal for institutional and commercial installations such as house of worship, boardrooms, call centers, restaurants and class rooms. These are available in standard shapes and can be combined with our Accent panels to add a touch of flair to any installation. When wall panel placement is limited, Primacoustic offers a selection of ceiling tiles that can reduce flutter echo and stop noise from traveling between rooms. For the budget minded, Primacoustic also offers a nice selection of open cell acoustic foam for the home studio enthusiast to treat practice rooms home studios and other noise prone places. 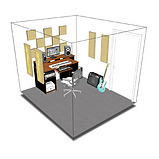 Primacoustic room kits have been carefully designed to address primary acoustical concerns that are common to all rooms by combining various components such as wall panels, bass traps, diffusion and hardware into an easy to use format. The London 12 is the flagship. It features fabric covered high-density glass wool panels for even absorption throughout the audio range. This makes the London 12 the ideal choice for more demanding studios, broadcasters and post production facilities while the innovative design can easily be adapted for home theater or high fidelity listening rooms. For those that need a budget solution, we also offer the home studio enthusiast with foam based products that can tame room chatter echo and primary reflections.